Raleigh Store classes will start at either 9:00am or 10:00am. Please be sure to take notice of the start time! 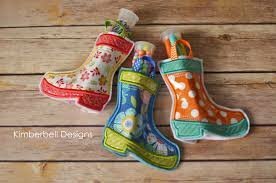 'Sweet Feet Rainboots' is an exclusive design only available at our Kimberbell Club- join us for only $10 and all you need to bring is a USB for this lecture demo based class. We will load the design in several different sizes as well as the step by step instructions for you to follow right at home! A THREE part series of all the basics of embroidery, starting at the beginning and working all the way to being a professional! You will not want to miss this! Each class is one day only, but will occur 4 times in one month! In part two of our series you will now be getting more advanced with your embroidery and that means trouble shooting machine issues as well as preventive maintenance. You will machine embroider a t-shirt as well as a cork key chain leaving with both projects complete. After we embroider you will personally disassemble a machine and oil and clean it after use, so you can have hands on experience with cleaning the machines before you go home. The last portion of our series will be advanced and you will learn how to run a business with your flatbed embroidery machine. We will go over pricing, advertising, and where to sell handmade products. You will make 2 different projects that are geared to an embroidery business! 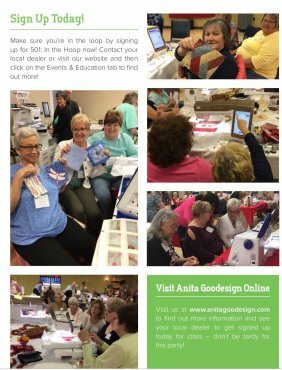 Join us for a fun day of embroidery with one of Anita Goodesign's highly trained instructors. 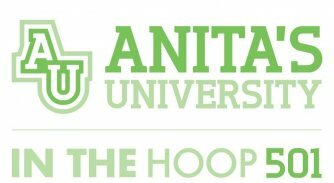 Create beautiful projects in your embroidery hoop while learning advanced tips and tricks at Anita Goodesign's newest embroidery event! You will take home a binder with over 130 embroidery designs that includes printed step by step instructions as well as a USB with all of the designs already loaded for you. 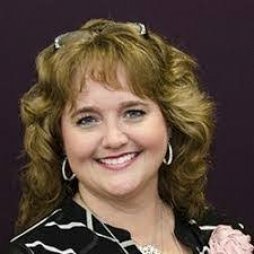 Missy Billingsley from Missy B Stichin is coming to Carolina Sew n Vac this summer and you will not want to miss her! Come join this sewlebrity for a fun filled day of embroidery, IQ Designer, serging inspiration and more!